Get TNPSC Drug Inspector Syllabus 2019 & TNPSC Junior Analyst Syllabus 2019 from this page. We had furnished all the details of the TNPSC Syllabus 2019 PDF and also the download link. Candidates who had applied for the TNPSC Drug Inspector and Junior Analysts Exam should know the information and use them during the preparation process. Also, the Officials are making arrangements to conduct the Examination for all the applicants as soon as possible. Such that, candidates need to prepare well for the Examination, in order to gain their desired role in the Tamil Nadu PSC. Down here, we had given additional information which helps the aspirants to get into the organization of the tnpsc.gov.in. That is the details of the TNPSC Drug Inspector Exam Pattern 2019 and the TNPSC Drug Inspector Selection Process 2019. Get more detailed information from the below sections. Tamil Nadu Public Service Commission has assigned the responsibility of conducting the TNPSC Drug Inspector Selection Process 2019 to the Selection Committee of the Tamil Nadu. 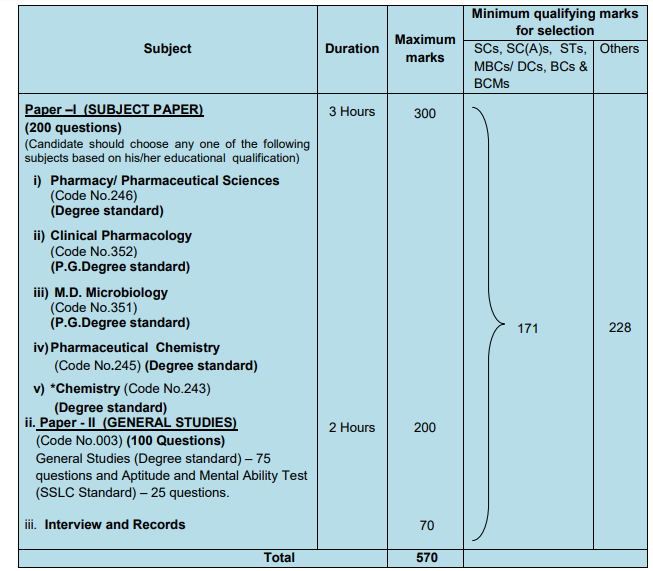 So, check the details of the qualifying process for the Drug Inspector, Jr Analyst posts. Candidates need to the Written Test first, then, they should accordingly attend the Personal Interview if they are selected in the Written Test. Therefore who have applied for their desired posts in the Tamil Nadu PSC need to have a complete idea on the Selection Process and TNPSC Drug Inspector Exam Pattern 2019. Get them all from this page. The Exam Pattern details are given clearly in the following table. Tamil Nadu Public Service Commission has set the TNPSC Drug Inspector Exam Pattern 2019. We had collected the information from the Official website and inserted here in this page to help the appearing candidates. Mostly, all the aspirants are looking to gain knowledge of the pattern of the exam such that they can know the structure of the exam. Accordingly, they can know the number of subjects and their names, number of marks and the time duration of the Exam. After referring to this section, follow the Tamil Nadu Public Service Commission Syllabus given in the down sections. 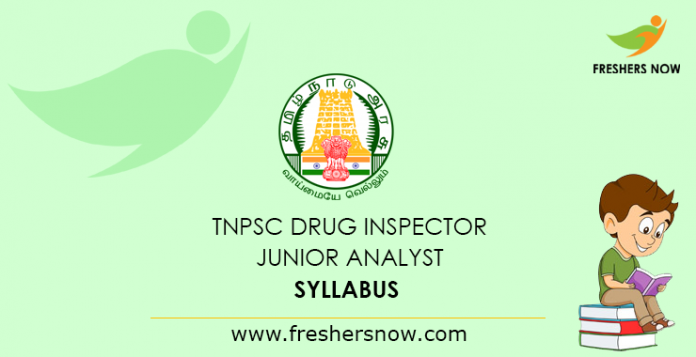 Get the TNPSC Drug Inspector Syllabus 2019 at first. Then, prepare a timetable to cover all the subjects & Tamil Nadu PSC Examination Topics. Check the syllabus to know the exact subjects. Post and hence note down the subject marks. Prepare high weightage subjects first then read the remaining subjects. Use the TNPSC Study Material. Revise all the subjects for the perfect preparation of the TNPSc Drug Inspector and Junior Analyst written exam. Collect the TNPSC Previous Papers, and practice well. Take several Mock Tests for better preparation of the exam. TNPSC Junior Analyst Syllabus 2019 & the TNPSC Syllabus 2019 PDF are given to make an individual task easier. Download them to your device and use it during the preparation. Similarly, improve your knowledge on each and every subject given in the TNPSC Syllabus 2019 PDF. So, you can gain the highest marks in the examination. Also, use the TNPSC Drug Inspector Syllabus 2019 until the examination date comes. Implement your plan as per the schedule you had prepared, then only, you can gain a good score in the coming Examination conducted by the Selection Committee of the Tamil Nadu Public Service Commission. Hence, to get all updated notifications, bookmark our website @ Freshers Now by pressing Ctrl+D. In case if you have any doubts regarding TNPSC Drug Inspector Syllabus 2019, please let us know through the comment section given below. We will update you with suitable answers. Thank You and Good Luck!! !